Boys 2 piece christening outfit, features little satin elasticated pant with hemmed cuff, matched with a soft satin shirt dressed with a peter pan colar and attached bow-tie. The shirt is button through at the back . 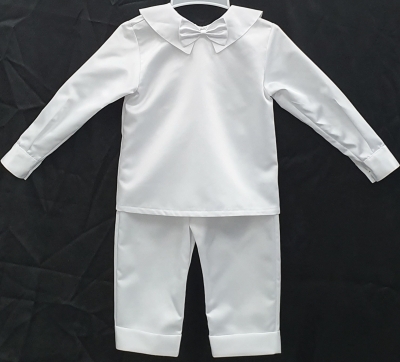 The suit comes in white and is made of an easycare sheen fabric, and is available in sizes 0000 to 2.